Get your FREE system check today. Simply bring your troubled device or system in and one of our technicians can have a look and provide advice on the most likely problems, cost of repairs, and any other applicable information. This is provided absolutely FREE with no obligation to go ahead with any suggested repairs. We also repair all Apple devices and systems from iPhones to iPads, and Macbook and iMac systems. We can assist with basic troublehsooting up to advanced complete system failures. Additionally we can provide advice for business integration, upgrade paths, and typically at a cheaper and faster rate than the official Apple stores. If you are having issues with your mobile device, we now also provide complete repairs to a large range of Smartphone and Tablets including Samsing Galaxy phone and tablets, Sony Xperia smartphones, Google Nexus, HTC and more. Contact us 7 days and let us know how we can assist with most repairs being completed same or next business day. 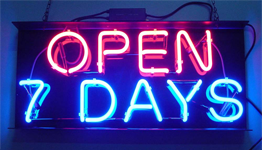 Our service centre is open 7 days so call today on (02) 9698-9644 or support@battech.com.au and remember you can view our full opening times and location details on our contacts page.